In 2011, the late Christiane Howey accepted a meeting request from the Chesapeake Bay Foundation’s (CBF’s) development branch. There was no set agenda and the folks from CBF had only but a vague idea of what our company did. As we met for the first time, we quickly learned that MTI and CBF have closely aligned mission goals – supporting conservation and education, not to mention, we’re located not far from each other. We began brainstorming ideas on how we could work together. To further advance our collaboration and to gain understanding of what CBF was all about, they invited us to visit their educational centers near Tangier Island, the epicenter of blue crab fishing in the Chesapeake. During this trip we learned of an interesting outreach effort CBF was undertaking to promote awareness of the Chesapeake Bay watershed, its vastness and how runoff and pollution from far away can affect the Bay’s water quality. Two of CBF’s staff (John and Beth) were going to ride their bicycles around the entire perimeter of the Chesapeake’s watershed. Coincidentally, several months prior to our initial meeting with CBF, we launched our new line of GSM transmitters. While John and Beth were to follow their own GPS-mapped route around the Chesapeake’s watershed extending north into New York and west into Pennsylvania, we all thought it would be a fun idea to make sure that they stayed true to their word. As proven on 100s of bird and fish species, it’s nearly impossible to hide one’s whereabouts when instrumented with one of our devices. 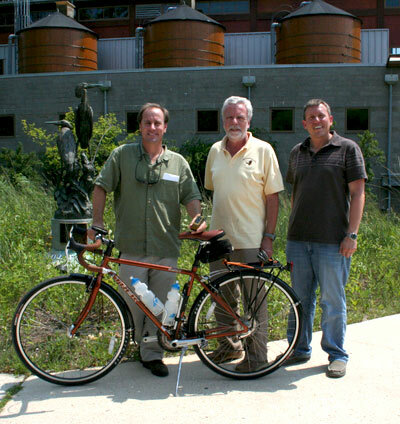 So, Paul and Lance arranged to meet John and attach a 70g GPS/GSM transmitter to his bicycle. There would be no cheating. This fun experiment was the start of something special. CBF interacts with 1000s of students and teachers in their various educational programs. 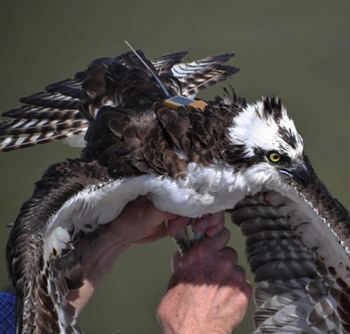 We thought it would be great to continue our collaboration and for CBF to use data collected from our devices in these programs and to teach migration and nesting behavior concepts focusing on the Bay’s most iconic bird species, the Osprey. Participants in CBF’s educational program could follow the birds at home by interacting with data and maps on their computers, providing a lasting connection to the Bay ecosystem. From 2013-2017, with the help of our friend and collaborator Rob Bierregaard, CBF and MTI tagged birds each year at several locations around the Chesapeake Bay, mostly near CBF’s educational centers. CBF’s Osprey tracker has become one of their most visited pages on their website, and we hope to continue working together on other projects in the near future! Read more about our friends at the Chesapeake Bay Foundation and their programs.